Honda Motor has developed the world's first electric motor for hybrid cars that doesn't use heavy rare earth metals -- a major step forward in development of motors that are free from the political whims of the Chinese government. Rare earth metals are important for the production of many high-tech devices, including smartphones and the magnets in motors. About 80 percent of the global supply of these metals comes from China, and in the past, the country has restricted access to some of them for political reasons. In 2010, for example, it blocked exports to Japan for two months over a territorial dispute. That incident that prompted Japanese companies like Honda to start working to reduce their reliance on rare earth metals. So the motor announced on Tuesday is a big deal, not just in terms of technology but of geopolitics, too. 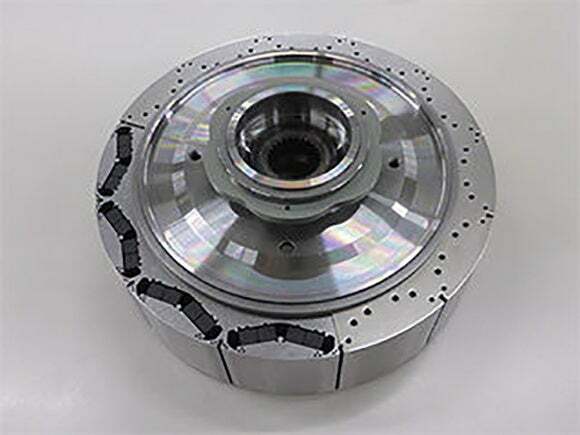 A rotor for the Honda i-DCD drive motor that's made without the use of rare earth metals. Traditionally, the neodymium magnets used in hybrid and electric car motors included one or both of the rare earth metals dysprosium and terbium. They were added to ensure very high heat resistance. But Daido Steel, a Japanese steel maker, came up with an alternative production method that produces a magnet with even greater heat resistance properties without requiring the rare earth metals. Honda worked with Daido Steel on perfecting the magnet and designed a new motor for use in hybrid vehicles. Daido Steel will begin mass production of the motor in August, and Honda plans to use it in the "Freed," a new minivan the company will launch in Japan later this year. Honda said it plans to use the motor in new car models moving forward.